A stylish professional tenor with gray onyx finish. 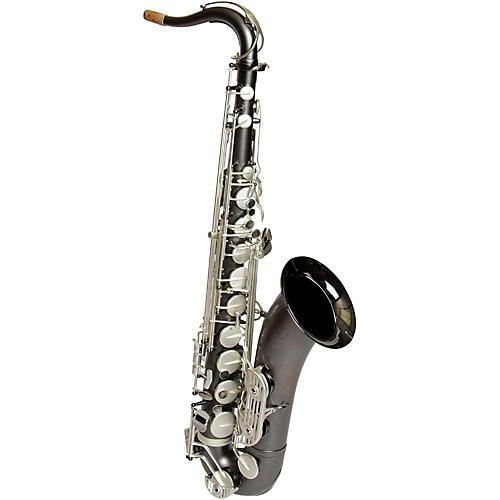 Sax Dakota offers professional-quality saxophones in all of the primary categories. This is the SDT-1200 GO tenor saxophone. Saxophonists will appreciate the playing action, cosmetics and most of all the sound of this instrument. The left hand pinky plateau table action is smooth, solid and fast, and sleek double key arms coupled with solid stainless steel rods guarantee instant pad closure and a tight seal. All of the keywork is likewise effortless, and its exclusive 6.26" graduated large bell carries to the back of the hall. Double-braced keys add to its stability and playability and a modern looking key stack gives it a contemporary stylistic. It is available in three distinct finishes, each of which are bold and stylish. It is presented here in Gray Onyx, which features a matte gray exterior and a polished gray interior. This is a pro tenor with a lot of presence and personality, and it is offered at a very reasonable price. Pro features and smart styling at a fair price. Consider Dakota.